Love him or hate him, Jose Mourinho is The Man right now. 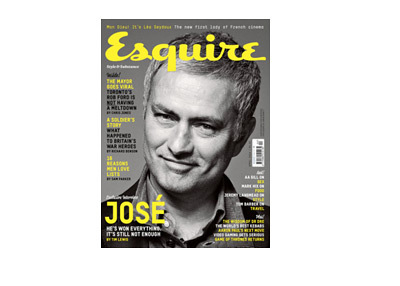 Chelsea are first in the Premier League, his face is on the cover of the new Esquire Magazine, and he has just been announced as the ambassador for the new Jaguar F-Type. Jose Mourinho is flying high at this very moment, and he deserves every minute of it. He has won the Champions League twice, in addition to countless other trophies while in charge of Porto, Inter, Chelsea and Real Madrid. He has worked with the football's biggest stars, including Zlatan Ibrahimovic, Cristiano Ronaldo, Didier Drogba, Eto'o, Mario Balotelli and Wesley Sneijder. He has been the father figure to many, and a vicious enemy to more than a few. His ethics are questioned, but the results speak for themselves. The Esquire Magazine (see link below) compare him to the mafia boss Tony Soprano. He is the first person in Britain to own the new Jaguar F-type! His last year at Real Madrid was tough, but ever since the double league win vs. Manchester City, Jose has been back in full force. And it is good to have him back!